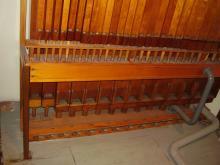 Fairbury United Methodist Church is the owner of a Gratian Pipe Organ. They were originally made in Alton, IL, the company was founded in 1858. In 1940 the firm was moved to Kenney, IL. This is the first step in an ongoing releathering of the entire instrument.